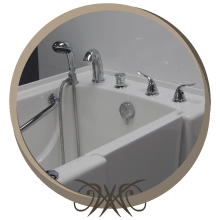 Having built walk in tubs for over 15 years, Hydro Dimensions prides itself on building the finest walk-in bathtubs in the industry. Each walk-in tub is built to order, which gives you the ability to design the in home spa of your dreams with the features & upgrades designed by you. This section walks you through our standard features, as well as some of our highlighted upgrades and custom capabilities. If you don’t see exactly what you are looking for, rest assured, we can build it for you. Every walk in tub features a premium hand held shower wand. An optional slider bar is available to convert your hand held shower head into an adjustable, wall mounted shower fixture. Proper seat height is critical for your safety and comfort, enabling you to comfortably stand from a sitting position. 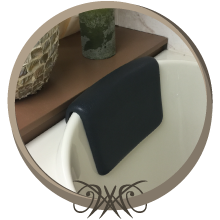 Our 17″ high seat meets ADA requirements, and 0the low entry threshold allows you to enter the tub without having to excessively lift your feet to get into your walk in tub, thus reducing the risk of falling. A contoured door latch has been ergonomically designed so you can operate the door handle with minimal effort. 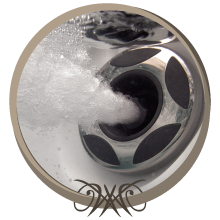 Not only are door drains a requirement to meet federal certifications, they also collect water that may collect when the door is opened or while you are exiting the tub. As part of our commitment to safety, our walk-in bathtubs incorporate a tile flange to prevent water from seeping behind the tub when it is properly installed. 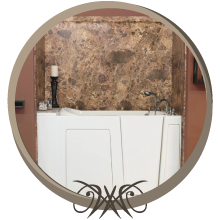 For applications where you are replacing standard 60″ tub with a new walk-in bathtub, Hydro Dimensions includes a filler panel to complete that finished look. From a soft tissue Air Massage to deep tissue Hydro Massage, and the all encompassing Dual Massage, we built each Massage Therapy System to order to truly create that in-home spa experience. The HD Comfort Warm System, gently heats up to wrap you in warmth before, during, and after your bathing experience. Medical grade Ultraviolet (UV) light kills bacteria, viruses, algae, mold, yeasts, and disease causing microorganisms. Created from the air we breathe, Ozone is a powerful sanitizer known to kill disease-causing microorganisms. This air systems sanitizer leaves no harmful by-products and quickly converts back to oxygen. Imagine the scent of a tropical rainforest or lavender flowers as you enjoy your in-home spa. Aroma Therapy enhances your bathing experience by involving your sense of smell. As air is drawn in to the air system it passes through the Aroma Therapy System and gently diffuses the smell through the water, enveloping you in your favorite scents. Hydro Dimensions also offers a full line of aroma and bathing products. Light Therapy has been shown to reduce stress through the use of gentle lighting effects within the water. With over 20 colors to choose from, you can choose one color or have the LED system gently cycle through the spectrum of colors. Your in-home spa should reflect the peace and tranquility it provides. Hydro Dimensions offers several color packages to enhance the elegance of your walk-in bathtub. 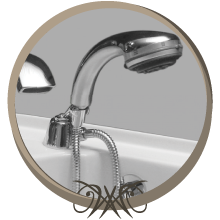 Custom color matching is also available so we can match your existing bathroom fixtures. Adding a hand held shower slide bar to your bath or shower area will provide additional comfort and ease of use for the bather. Our contoured curtain rod allows the pre-sized curtain to fit the curvature of the tub to minimize water spray and give your tub the finished custom look. The shower curtain has also been custom manufactured to a shorter length so you are not sitting on the curtain while bathing, this making it more comfortable and safe. Add that finished touch to your new walk in tub with one of our HD wall surround kits. Sampled from natural stone, our wall surrounds give your walk in tub and bathroom a rich look at the fraction of the cost of natural stone.